The Jeluvian Project is primarily an action game, but you need to implement some strategy and tactics. You will have to decide which path your squad will take, which enemies you will attack, when to cease fire and when to open fire. 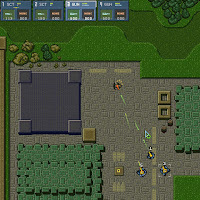 It uses the familiar RTS controls, where you command your drones with the mouse. But at the same time, you get to make immediate decisions for them - you will have to aim, shoot, and reload. You take control of the action, not merely the strategics: More like being a Sergeant of a squad, rather than a General of an entire army.